“In a sense, Wola belong to land as much as it belongs to them.” Paul Sillitoe’s  consideration about the Wola farmers of the Southern Highlands Province of Papua New Guinea (PNG) brings us to the heart of a critical question: what is the value of land in a country like PNG? In the current context of land grabbing, why is it important to preserve traditional systems of tenure? In the West, people understand land as a private piece of territory with a title deed attached to it, but in PNG there are additional economic, social and spiritual dimensions to land. The vast majority of PNG’s territory belongs to its people. Until the end of the 2000s, 97 percent of the country’s 46 millions hectares were governed by local communities under consensual regimes of customary rights. These customary rules, which vary from one group to another, address the issues of land acquisition and transfer among community members. They also regulate the management of common areas, such as forests or water sources, and set forth a framework for responsible use of the land. For example, traditional systems employ the practice of letting land lie fallow, which maintains soil fertility and productivity over generations. Contrary to those who believe customary rights don’t allow for “efficient” use of territory traditional systems actually support productivity and sustainable resource management. By allowing households’ independent use of parcels, the customary rights structure also fulfills the basic needs of the population. As a result, Papua New Guineans in rural areas have a hybrid livelihood that relies on diverse land utilization strategies. On one hand, stable access to land helps insure a small commercial income for smallholder farmers who decide to sell their crops. Furthermore, land bears noncommercial value by providing families with the possibility of growing their own food, building a house, and leveraging other resources from their parcel by collecting plants for use as medicines, tools, textiles, cords, artwork, and so on. Compared to the excessive price of housing and food in an urban context, this lifestyle has many advantages. Additionally, land holds other significant social and spiritual value. 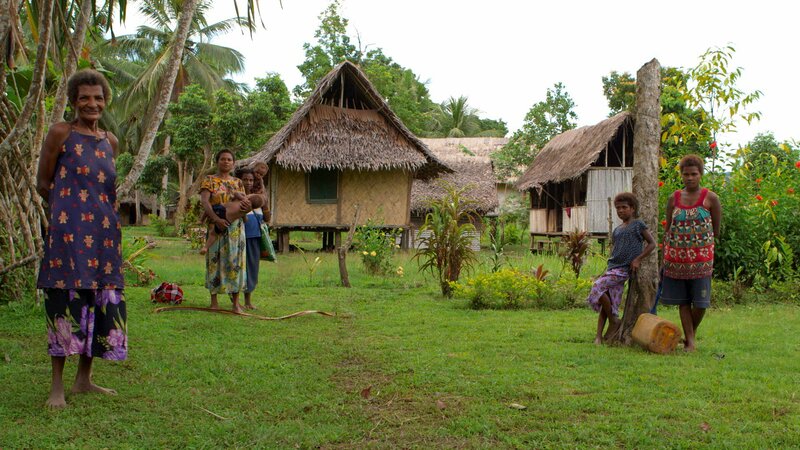 PNG is one of the countries with the most equal distribution of land on earth. This is partly because the country’s customs take as a point of departure that every human being deserves to establish a life of his or her own on a piece of territory. Through this lens, land allows the individual to relate to their history and ancestors who, in most cases, have been farming it for centuries. As relatively permanent object in an ever-changing world, land provides families with a spiritual support. Finally, the fact that customary rights are held at community level carries critical advantages for conflict resolution, common decision and knowledge building, as well as for solidarity maintenance. Despite the important benefits of the traditional system, the government of PNG has decided to reduce the number of parcels under customary tenure. Its Medium Term Development Plan (MTDP) 2011-2015 sets as a key objective to “release customary land for development” and plans to take control of 10,000 customary parcels by 2025. This would result in 20 percent of PNG’s land being withdrawn from traditional owners. In order to meet this objective, the MTDP also plans to scale up the country’s capacity to conduct proper land registration. Without registration, it is much harder to grant concessions to private companies because traditional systems don’t provide title deeds nor do they draw clear borders between parcels. Finally, despite the constitutional limitation of selling and acquiring land,  PNG’s government created an institutional strategy to provide “Special Agriculture Business Leases” (SABLs) to corporations once land is registered. Since 2003, the number of SABLs in the country has soared. This phenomenon led to the granting of 5.5 million hectares, 12 percent of PNG’s total territory, to private firms. However, conceding such huge amounts of land failed to bring the promised agricultural development. The Oakland Institute’s recent field investigation reveals that most SABLS have resulted in large-scale logging operations with no further investment in the territory. In fact, even in locations with longstanding agriculture projects (mainly oil palm plantations), the researchers found the situation in the villages did not improve. In plantation areas visited by researchers, local populations still lacked access to basic infrastructure and services. Implementing new mechanisms to increase the land leases for foreign investors is therefore not a guarantee for rural development. Besides, the cost of giving up on the current customary right systems might be higher than expected. As demonstrated by Tim Anderson from the University of Sydney, revenues from the leases don’t match the actual value of families’ hybrid system of subsistence and small-scale commercial agriculture. Customary landowners find themselves disadvantaged because they have little or no bargaining power to counter both corporations and the state’s pressure to “free up” land. Lastly, leasing the land to foreign investors is an isolating process that dismantles communities. Because traditional solidarity networks will be damaged--and urban living does not offer many opportunities in PNG  a large portion of the displaced landowners risk falling into poverty and suffering from food insecurity if they lose their access to their traditional land. However PNG’s land registration policy, which has long been encouraged by agencies such as AusAID and the Asian Development Bank  brings more concerns than hopes about the country’s future. Giving up on customary rights leaves local communities deprived of their fundamental resources without bringing the economic advantages that have long been promised by international institutions. As Tim Anderson remarks, “there is no popular demand for land registration in the country.” It is therefore time to start thinking of other development models that do not threaten communities’ fundamental rights and rural populations’ access to land. Furthermore, private ownership and commodification of land are notions that deserve to be reevaluated in light of examples such as Papua New Guinean customary rights. 1. Sillitoe is a professor in the Department of Anthropology at Durham University, and has conducted extensive fieldwork in PNG. Sillitoe, P. "Beating the Boundaries: Land Tenure and Identity in the Papua New Guinea Highlands." Journal of Anthropological Research, Vol. 55, pp. 331–360, 1999. 2. Building the foundations for prosperity Papua New Guinea medium term development plan 2011-2015. Department of National Planning and Monitoring, 2010. 3. Section 53.1 of PNG’s constitution states that "possession may not be compulsorily taken of any property, and no interest in or right over property may be compulsorily acquired." 4. Anderson, T. "On the economic value of customary land in Papua New Guinea." Pacific Econonomic Bulletin, Vol. 21, 138–152, 2006. 5. UN-HABITAT’s last report records an unemployment rate of 50 percent in Port Moresby, the capital of PNG in Papua New Guinea: Port Moresby Urban Profile, UN-HABITAT, Regional and Technical Cooperation Division, 2010. 6. Making land work, Reconciling customary land and development in the Pacific. AusAID, 2008; Papua New Guinea, Critical Development Constraints. Asian Development Bank, 2012. 7. Anderson, T. "Melanesian Land: the impact of markets and modernization." Journal of Australian Political Economy, pp. 86 – 107, 2011.